The Teesta river dispute makes headlines every time there is a bilateral talk between India and Bangladesh. The dispute is regarding water sharing of River Teesta. Bangladesh wants a higher share than it gets now. Currently, its share is lower than that of India’s. This article gives a broad insight on the river water sharing dispute, a timeline of various commissions formed, proposed alternative solutions etc. Teesta is a 414km long river flowing through the Indian states of West Bengal, Sikkim before going to the Bay of Bengal through Bangladesh. It is the fourth largest transboundary river shared between India and Bangladesh after Ganges, Brahmaputra, and Meghna river systems. 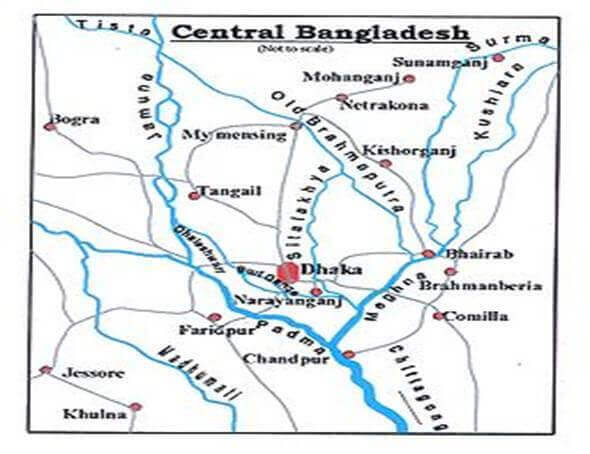 According to the report of Asian Foundation in 2013, its flood plain covers about 14% of the total cropped area of Bangladesh and provides direct livelihood opportunities to approximately 73% of its population. 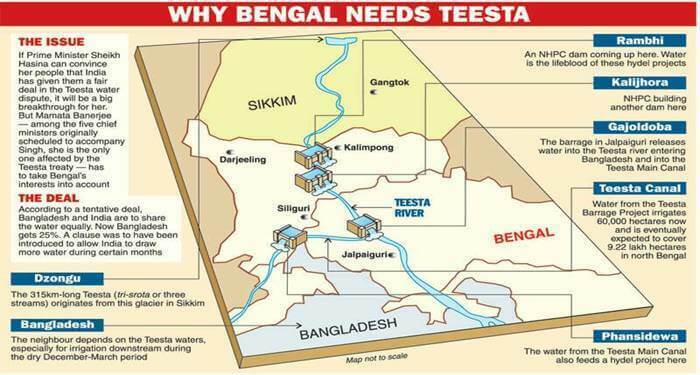 Teesta is the lifeline of North Bengal and almost half a dozen of districts of West Bengal are dependent on the waters of Teesta. The negotiations on how to share the water have been going on since 1972. 1972: Joint River Commission (JRC) was established by India and Bangladesh in the Indo-Bangla Treaty of Friendship. 1983: Agreement on Ad-Hoc sharing of Teesta water. According to agreement Ad-Hoc sharing is valid until 1985 end. 1984: According to 1984 JRC, Bangladesh’s share increased based on the hydrological data. 1998: Bangladesh started “Teesta Barrage” irrigation project (3 cropping seasons per year). 2011: an Interim deal that was supposed to last for 15 years – gave India 42.5% and Bangladesh 37.5% of Teesta water. Note: However, West Bengal and Sikkim opposed an interim deal, since then the deal was shelved and remains unsigned due to the objections of West Bengal. Article 253 of Indian Constitution gives power to the Union Government to enter any transboundary river water related treaty with a riparian state. The centre cannot do it arbitrarily without taking into consideration the social, political and eco-impact of such a treaty in the catchment area. In 2011, the West Bengal government commissioned a study on the Teesta issue under the noted hydrologist Kalyan Rudra. This is not acceptable to Bangladesh, where the water is required mainly during December – April period which is considered to be the leanest. 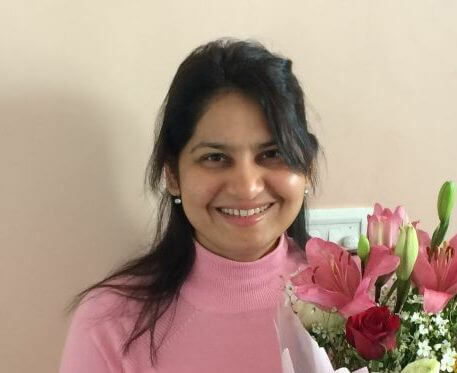 Connection to global warming: Many of the glaciers on the Teesta river basin have retreated, says a strategic foresight group, a Mumbai think tank. 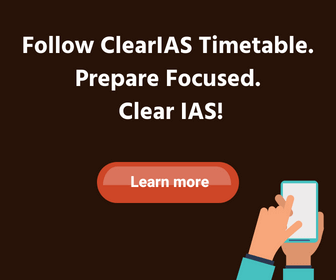 Estimates suggested that Teesta River has a mean average flow of approximately 60 billion cubic meters, of which significant amount flows during June and September and October to April is considered to be a lean season. Any treaty will dry out northern region of West Bengal and will hurt farmers. In 1998, Bangladesh’s Teesta barrage began, and the farmers of Bangladesh enjoyed 3 cropping seasons per year and don’t deserve any more water. Project in West Bengal aims at irrigating 9,22,000 hectares of land in North Bengal and provides 67.60 MW of hydropower. Any water sharing with Bangladesh will hamper the project. 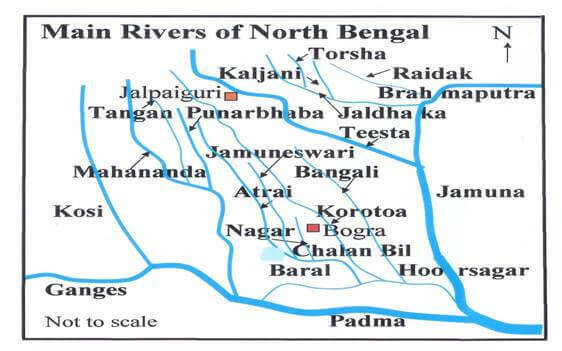 Mamata Banerjee proposed sharing of rivers like the Torsa, which are closer to the border of Sikkim and Bangladesh. The Torsa, in fact, has connectivity with Bangladesh’s Padma. She proposed that the two countries set up a commission to ascertain the level of water flowing through the Torsa and the quantum of water that can be shared. 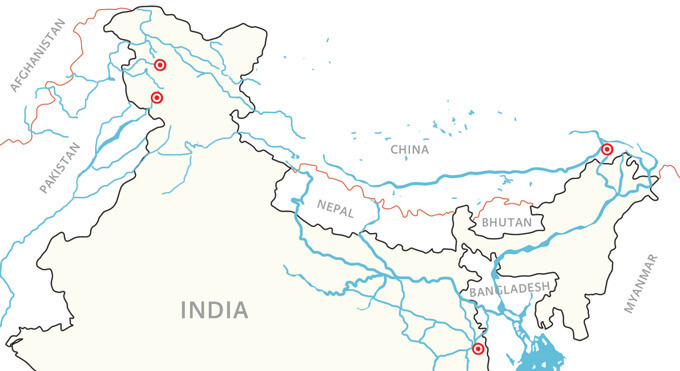 India already enjoys a share of 55% of the river water. Bangladesh claims 50% of the water between December and May every year because that’s when the water flow to the country drops drastically. Over 1 lakh hectares of land in Rangpur – its rice bowl cannot be cultivated for winter crops due to excessive withdrawal of water by India. Bangladesh demands a fair share of river waters during the dry season. The previous Bangladesh Nationalist Party (BNP) govt. headed by Begum Khaleda Zia was not very receptive to India’s concern. The BNP, during its tenure in power between 1991-1996 and again from 2001 to 2006, provided shelter to leaders and cadres from various North East based terror outfits. But Sheikh Hasina’s Bangladesh Awami League(BAL) party followed India-friendly policies and also adopted a zero tolerance policy against anti-Indian terror outfits and eventually ULFA was banned. The cooperation between the two nations facilitated the finalisation of land boundary agreement. 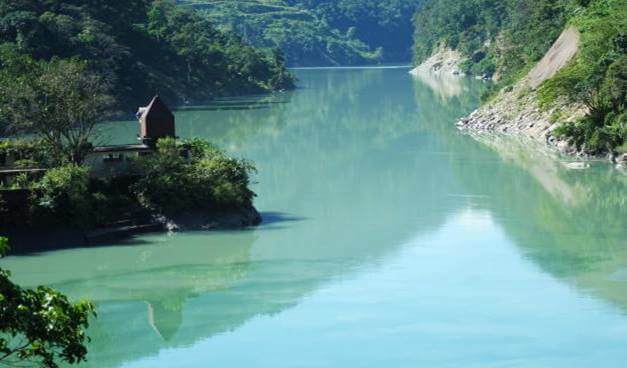 The Teesta River water deal as anticipated will help Delhi get more political leverage which it thinks is necessary to check the rising influence of China in the Bay of Bengal region. Bangladesh is a significant neighbourhood for India with a shared history, culture, religion and many more common elements. For Bangladesh, this issue is still considered to be a prolonged suffering inflicted by India. The cooperation of Bangladesh is important to India and without such liberal regimes in neighbouring countries, India cannot become terror free. Bangladesh is an essential element for India to get connected with North East. 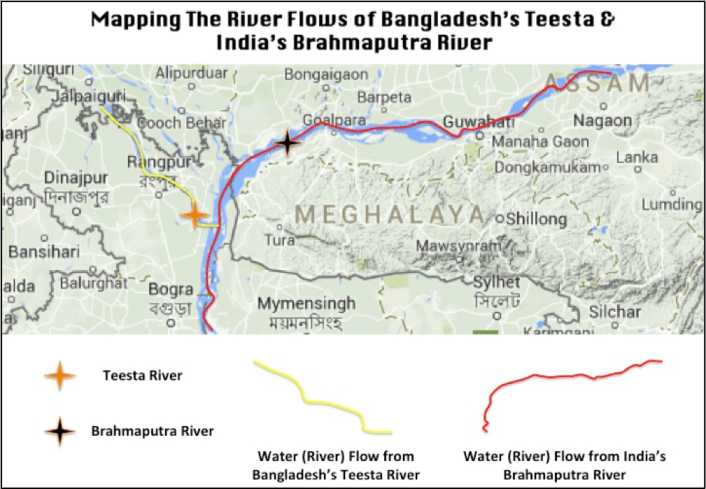 Considering the strategic importance of Bangladesh and as a responsible upper riparian state, India needs to take proactive steps for early conclusion of Teesta agreement. How the river water sharing is measured and if Bangladesh seeks more water why can’t the same claim be made by India? Why in the winter time the flow is reduced? In winter time the ice is not melted at the same rate as in summers.